The invention of elaborately constructed flying machines to travel through the Earth’s atmosphere ranks among mankind’s greatest innovations. The field of aviation is defined by challenging the limits and coming up with bold new ideas, but these aircraft simply defy all concepts of normalcy. To supplement standard aircraft, a variety of interesting combination machines are available to pilots. However, a jet fighter designed to land right in the ocean adds an entirely new definition to the job description, turning pilots into jet ski operators. 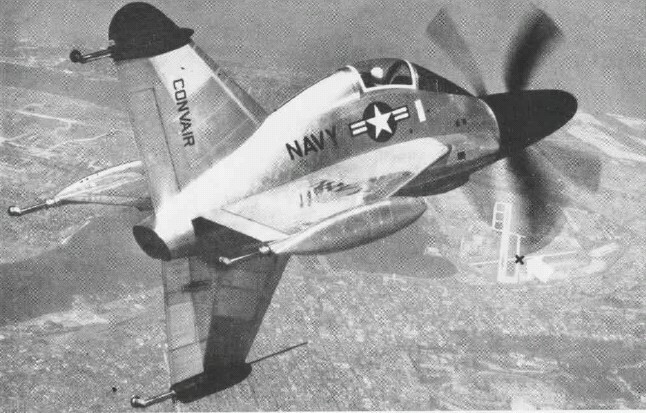 The Convair Sea Dart was an experimental American Jet Fighter built in 1951 as a prototype supersonic seaplane, complete with a waterproof hull and two hydrofoils. The Sea Dart concept was retired after a fatal crash, but not before it became the first — and so far only — seaplane to break the sound barrier, with E.D. “Sam” Shannon at the controls. When a tire company attempts to enter the aircraft market, you can expect bizarre results. In 1959, Goodyear Tire responded to market demands for a convenient airplane in a spectacular manner. The open cockpit Inflatoplane was built entirely out of rubber except for the engine and control cables. The plane fit into a meter long box, and could be fully inflated with a bicycle pump in just 15 minutes. The machine was an aerodynamic success, as it took to the skies with ease. However, Goodyear encountered some challenges in convincing the military to buy the aircraft when they pointed out that the plane could be downed with by a single bullet, or even a well-aimed slingshot. NASA’s AD-1 brought the standard for strange aircraft to an entirely new level. Designed in the early 1980s to test the concept of a pivoting wing, the jet’s long, thin wing rotated on an angle, up to the point where the right wing tip could be brought parallel with the cockpit. The idea behind this unorthodox and completely new arrangement was to offset airflow disturbance patterns and increase streamlining. The strange aircraft flew a number of missions, and performed surprisingly well, but the results were not convincing enough to justify service production. However, modern drones based on this aircraft design are now under development. The Vought V-173 was developed in 1942 as a prototype vertical takeoff and landing aircraft capable of intercepting enemy fighters from an aircraft carrier. The bizarre design of the aircraft nicknamed “the flying pancake” by its test pilots consisted of an almost perfectly circular fuselage that also doubled as the machine’s wing. The two engines supported immense propellers which could only clear the ground through the use of exaggerated landing gear struts, while the power system was located in the wingtips, unlike any other aircraft ever made. Limited demand and a crash helped seal the fate of the project, but it began the lineage that led to the famous Harrier Jump Jet. Sometimes it’s best for experts to stick to what they’re good at. During the Second World War, Bell Helicopters produced a powerful, highly maneuverable fighter craft with superior strike and air to air combat skills. Most airplanes have their engines at the front, but Bell, being a helicopter company, created an airframe with the engine centered behind the cockpit. A long shaft spun the propeller at the front, but while the design offered amazing power, building an airframe around a helicopter style power source resulted in an unusual center of gravity. More enemy planes were shot down by this “sky serpent” than any other U.S. dog-fighter design used by the Soviet Air Force, but some Aircobras plummeted to their demise without so much as a shot from the enemy. Before the age of universal satellite technology, design specifications for a first class spy plane with unprecedented speed, endurance and the ability to reach the edge of space birthed the SR 71 Blackbird. A fearsome, almost alien ship, the SR 71 had devilish performance capabilities. But in a bizarre twist, the SR 71’s special permeable tanks would leak explosive jet fuel until the 900 plus degree Fahrenheit frictional heat caused them to seal. As it soared to altitudes of over six miles it exceeded speeds of 3,000 miles per hour, causing the surface of the aircraft to glow bright red. The hellish scene outside was no comfort to the pilot cocooned in the asbestos insulated cockpit, who would have to wait up to half an hour upon landing to avoid melted feet upon exit. Even the canopy would reach 572 degrees Fahrenheit. The Grumman X23, or “Pogo,” represents a radical departure from the norm of aviation design, taking it past eccentricity and into full blown absurdity. The body of the Pogo was shaped somewhat like a regular airplane, except for the rotor attached to the nose cone that lifted it vertically into the air. Unlike most “VTOL” aircraft, the Pogo took off nose first like a rocket with the wheels attached to its tailfins. The canopy pointed 90 degrees outward, causing the pilot to lie at right angles with the ground as the machine rose. The “Pogo” was supposed to then fly forward though the air once it had stabilized. Several successful test flights were made, but like many aerial misfits, the project never got far off the ground. The X-15 is an older design, but it was such a significant and anomalous leap forward it remains unsurpassed in the arena of aircraft performance. 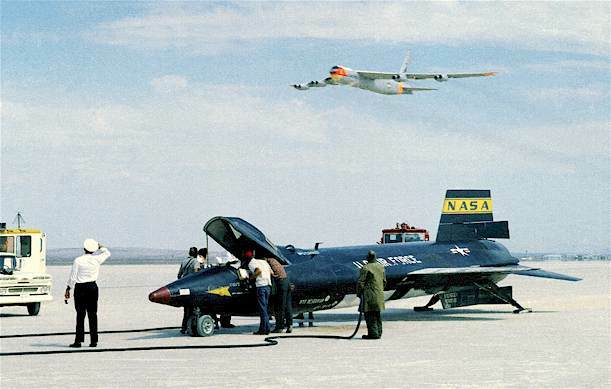 First tested in 1959, the X-15 Rocket Plane measured 51 feet in length, with two tiny, 9 foot wing stubs on each side. A series of tests saw the plane reach altitudes of 100,000 feet, with two missions qualifying as space flights. During the aircraft’s passage through the atmosphere, the small, rocket like jet reached speeds of over six times the speed of sound. The X-15 was coated with a special nickel alloy similar to that found in natural meteorites, which prevented Planet Earth’s fastest ever machine from burning up in the atmosphere. The X-15 defined the niche of extreme specifications with its high weight, high power and low lift. In the natural world, symmetry is the rule in everything from eyes to wings. In the reverse engineering principles nature inspires, that rule holds true for engines, fins and tails. 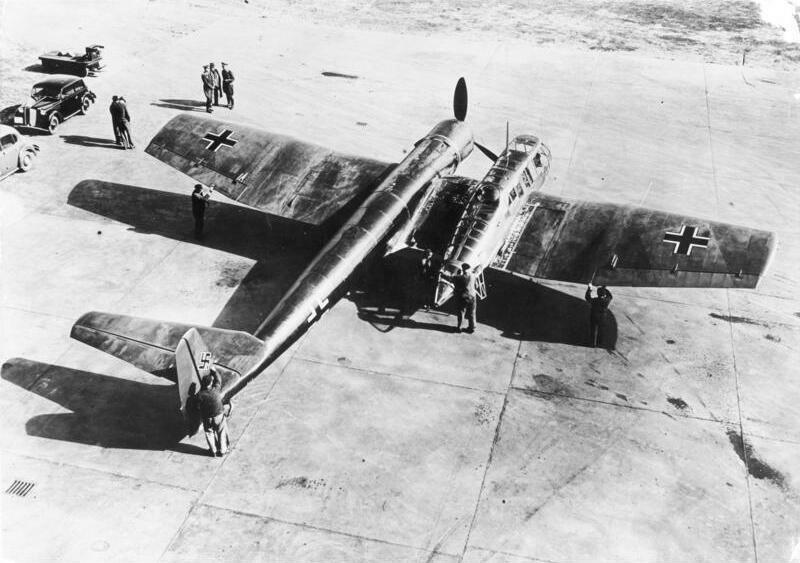 But during World War II, in a marked departure from the norm, German aircraft engineers at Dornier conceived a reconnaissance plane and light bomber with a single wing, a tail boom with an engine on one side, and right beside it, a pod to carry the pilot. Although such an arrangement would appear unbalanced, placing the pod on the right hand side of the propeller boom counteracts the torque and helps the aircraft fly straight. Thus, this freakish flying machine not only made it off the ground, but inspired a modern sport aircraft with a similar design. Consider a house boat crossed with an airplane. That was the idea behind Count Caproni’s Ca.60. This 1920 machine set the standard for bizarre multi-wing aircraft so high that even Richtofen’s Red Fokker would look definitively mundane in comparison. Measuring 70 feet in length and weighing a whopping 55 tons, Caproni’s enormous floating flying machine was built to be the first transatlantic airliner in aviation history. Borrowing from the theory that enough wings will make anything fly, the ship-like fuselage bore a stack of three wings at the front, three in the middle, and instead of a tail, a third set of three wings at the back. The unearthly machine could only be described as a triple triplane and nothing similar was ever built. Lifting off was not a problem, but the plane crash landed on its first flight after reaching a height of about 60 feet. Caproni announced that he would repair it, but the wreckage was later burned overnight. Mr. Stephens your comments about Bell Aircraft and the P-39 Aircobra show your lack of research as it is very flawed. Bell Helicopter is the descendent of Bell Aircraft which was founded before World War 2. The company started off in New York in an old plant originally owned by Curtis Aircraft Company and later Consolidated Aircraft. The company started off building planes not helicopters. The later came about after WW2. The P-39 was a pre war design later evolving into the P-63 Supercobra. It was initially used in the front lines but was slow and not as maneuverable. Main problem was it used the same Allison Engine as originally used in the P-51 Mustang. The engine wasn’t supercharged so performed poorly at high altitude. Now to address the engine placement. The plane had a 37mm canon in the nose which shot through the center of the propeller hub. So they had to move the engine to meet the spec for the canon. It also had four machine guns (2 per wing). Chuck Yeager flew one early in his career. Surprised you missed the car door which made it dangerous to escape. Many of these planes were sold to the U.S.S.R. (Russia) and used as tank busters. The canon was great for tank busting. Another Bell Aircraft flown by Chuck Yeager was the X-1 the first plane to break the sound barrier. So please get your facts straight.